St Columba’s stunned the Halifax AFL’s Premier Division’s rising stars Shelf FC in the quarter finals of the Halifax FA Albert Crabtree Cup on Saturday. The Division Two side beat the Challenge Cup holders in a penalty shoot-out after a 2-2 draw at Natty Lane. AFL title favourites Ryburn United powered through 5-1 at home to division-lower Brighouse Sports at Ripponden Wood in the other last-eight contest. The pair will join holders Huddersfield Amateur from the West Yorkshire League and their neighbours Ealandians from the Yorkshire Amateur League in the semi-final draw. Both those sides play in the top flight. Saints almost won their time in regulation time, Alex O’Keefe scoring with a near-post header from a corner with 30 seconds of added time left to temporarily save Shelf’s bacon. 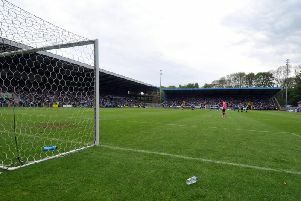 However, Saints dusted themselves down and converted all four of their spot kicks while Shelf managed just one success with goalkeeper Macauley Richardson emerging as the home hero. Saints have a history of pulling off cup upsets and this was perhaps their biggest yet. They had an early escape when Jack Dobson handled in the area but referee Wayne Cotton was unsighted. Shelf were on top for long spells of a goalless first half and they forced a series of last ditch blocks and tackles from a committed Saints side. Saints grew into the game and showed that they too had goals in them with speedy duo Vinny O’Shea and Kutubo Touray looking to get in behind the visitors’ defence. Shelf got the breakthrough after 55 minutes when Richardson could do nothing about Matthew Hartley’s firm shot, which went in off the underside of the bar from 20 yards. Skipper Ryan O’Neill slid in from nowhere to block a shot on the line and keep Saints in the tie. Frank Odion and young Macauley Mountain came on up front for Saints and their fresh legs and pace made all the difference on a heavy pitch. The equaliser came when Odion broke clear down the right channel and calmly slotted through the legs of the Shelf keeper. Shelf continued to attack but were leaving more space at the back for Saints to exploit and Mountain broke down the left and put Saints in front. O’Keefe forced penalties but Richardson made two saves to send his side through. Christian Silkstone, Reece Uttley, Brad Waddington, Owen Wilkinson and substitute Tom Hiley hit the target for Ryburn at Ripponden Wood with Connor Durkin replying.